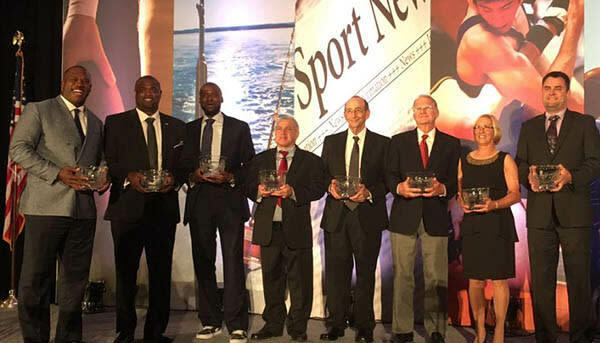 Click here to see past Sports Hall of Fame inductees. The native Floridian is a familiar face on the high school scene around the state, using multiple media outlets to promote the brightest stars. During his career covering high school athletics, he has written and worked for multiple respected outlets in TV, radio and print including South Florida High School Sports, CBS Miami, Hollywood Sun-Tattler, Miami Herald, Sun-Sentinel and currently, WQAM for the past decade. Blustein has 46 years of experience in his field. He has been a vital contributor to not only high school athletics, but the community as well. He is estimated to have helped more than 10,000 young men and women achieve their dreams of receiving a college scholarship. His knowledge of high school sports is legendary as well as his work in the community promoting and bring attention to causes and foundations such as No Child Goes Hungry and Feeding South Florida. Blustein is the recipient of the 1981 Broadcaster of the Year, 1997 Broward County Man of the Year, 1998 Miami-Dade Public Schools “Person of the Year” and Miami Herald Lifetime Achievement Award. He is a member of the 2008 North Miami Senior High School Hall of Fame, Broward County Wrestling Hall of Fame, Florida HSAA Hall of Fame and National Wrestling Hall of Fame. Blustein started covering sports while attending North Miami Senior High School. He moved on to the University of Nevada, Las Vegas, where he started his college career and became a reporter at KLAS Las Vegas radio station. Blustein returned to Florida and earned a bachelor’s degree at the University of Central Florida. Blustein lives in Hollywood with his wife Pamela. The Pompano Beach native is the co-founder and president of the Crockett Foundation, a South Florida based non-profit organization that serves youth through educational programs. Crockett earned an athletic scholarship to Florida State University where he joined his older brother Zachary as a member of the Seminoles 1993 National Championship team and Atlantic Coast Conference Championship teams (1993-1997). In 1997, Crockett was selected by the NFL Draft, spending five seasons with the Atlanta Falcons where he was a starter in Super Bowl XXXIII in 1999. He then went on to play two seasons with the Minnesota Vikings. The brothers returned to their hometown during the 2002 off-season and began hosting the annual Crockett Foundation Weekend. In 2009, Crockett created the Annual Crockett Foundation Community Health Festival for Broward County residents educating families on the importance of maintaining good health and positive lifestyle choices. Crockett is a member of the non-profit Executive Alliance of Broward, Orange Bowl Committee and Orange Bowl Youth Football Alliance chairman and serves as the Orange Bowl liaison for the NCAA Sun Belt Conference. He was recently accepted into Leadership Florida Class XXXV. In 2015, Crockett was honored at the Greater Pompano Beach Chamber of Commerce Annual Shining Star Awards Luncheon for the Crockett Foundation’s impact on the local community. Crockett is also President and CEO of South Florida Development & Investment Company. He earned his Bachelor of Science degree in Criminology at FSU and is an active alumni member of the Omega Psi Phi Fraternity. The South Florida native is a well-recognized professional athlete who enjoyed a successful career in the NFL and is now using his celebrity to give back to the community. Crockett is co-founder and vice president of the Crockett Foundation a South-Florida-based non-profit organization that serves youth through educational programs with the mission to help build character, develop leaders and improve the community. He grew up in Pompano Beach and attended Blanche Ely High School, where he played football and was All-County, All-District and All-State. He graduated from FSU in 1995 where he received a number of accolades including recognition as the first fullback to rush for 100-plus yards in a game since 1984 and was a member of the Seminoles 1993 National Championship team. He was drafted by the Indianapolis Colts, where he played for four seasons (1995-1998). He then played one year with the Jacksonville Jaguars (1998), and ultimately found his true home with the Oakland Raiders, where he spent nine years (1999-2007). Crockett played in 175 games with 61 starts, including a streak of 109 consecutive games played. During his professional football career, Crockett had 510 carries for 1,701 yards and 36 touchdowns. Crockett has continued his career in football, currently working as a Southeast Area Scout for the Oakland Raiders. Born and raised in Fort Lauderdale, Dooling was one of Broward County’s all-time greatest basketball players before going on to become a college and NBA star. A graduate of Dillard High School, Dooling competed in three State Final Four Tournaments, First Team All-County and rated 19th best senior in the nation. Dooling played college basketball at University of Missouri, where as a sophomore he averaged 15.3 points, making him the ninth highest scorer in the Big 12. Dooling was the tenth overall pick in the 2000 NBA Draft by the Orlando Magic. He was traded on Draft Day to Los Angeles where he played until he signed with the Miami Heat. He returned to the Magic in 2005. Three years later he was traded to the New Jersey Nets. He had career-highs in points, assists and minutes per game. After spending seasons with Milwaukee, Boston and Memphis, he retired in 2013. Dooling became a life coach for the NBA and NBA Developmental League and served eight years as a National Basketball Players Association officer. Dooling is a motivational speaker, life coach and author of an autobiography, “What’s Driving You?” He is the founder of Dooling Enterprises, which has multiple companies under its guidance aiming at sparking change and thought in our culture and beyond. Keyon lives in Irvine, California with his wife Natosha and four children. The first posthumous inductee left an indelible legacy in Broward County high school athletics and cultural affairs. During his 33 years of service for Broward County schools, his list of accomplishments are endless. As Director of Athletics and Student Activities, Huttenhoff implemented more than 30 athletic and special activities. This visionary created the “Game of The Week” program that received the MAGNA National School Boards Association grand prize as a community service model. Huttenhoff initiated new sports offerings in flag football and competitive cheerleading to enhance gender equity in sports programming. He implemented recruiting fairs involving more than 40 colleges and universities and created Scholar-Athlete, Arts for the Future and Outstanding Senior Leaders scholarship programs. Huttenhoff was born in Salinas, California and received his BA from Santa Clara University and Master’s degree at University of Southern CA. After an internship in Washington, DC, he started his career in labor relations for the City of Miami Beach. Soon after he joined Broward County schools holding positions in labor relations at the Superintendent’s office, followed by Director of Athletics and Student Activities, inclusive of National Honor Society and Student Government, and Cultural Arts and Affairs for more than 220 schools and 250,000 students. Damian’s memory is cherished by his wife Donna, and children Ryan and Michelle. The fishing industry pioneer was a visionary with the planning and designing of the IGFA Fishing Hall of Fame & Museum in Dania Beach. As President of the Fort Lauderdale Billfish Tournament in 1977, Leech established the rules and organized the first-ever evening swordfish tournament. In 1983, Leech was appointed IGFA Executive Director, a position he held for a decade. In addition to modernizing the organization, Leech played a key role in planning the first World Angling Conference in France in September 1984. A year later, he initiated the International Auction and Banquet generating millions to benefit IGFA, over the next 17 years. In 1992, the Board of Trustees appointed Leech as IGFA&apos;s fifth President and over his tenure, Leech made it his mission to increase membership and establish the IGFA as the world&apos;s most respected and authoritative fishing organization. He added new world record categories, discounts, line-testing and scale-certification services, and new angler recognition clubs. By 2003, All-Tackle Records existed for 832 species, up from 452 ten years earlier; the six-pound line class category was restarted; and State Freshwater Line Class Program was introduced. Leech created the IGFA Offshore and Inshore World Championships; Junior Angler World Record Program and Championship; and Certified Captain, Weigh Station, Tournament Observers and a program to keep marlin off the menu. The longtime Broward County resident and former wrestling standout began his coaching career as an assistant coach at Coconut Creek and Taravella High Schools. In 1988, he was hired as head coach at Cardinal Gibbons where he built a powerhouse wrestling program. Over the past 35 years, Pettineo coached 28 individual state champions, including his son, Frank, in 2009; 28 state runner-ups, 85 region champions, 225 district champions, 71 county champions, 264 county place winners, and 106 state place winners. In 1992, Pettineo brought a Division III collegiate wrestling tournament to Broward County to allow local high school wrestlers to be exposed to college level wrestling. Pettineo’s was 2005 NHSCA Team Florida Coach, 2006 USA Team Florida Wrestling Coach, Broward County All-Star Coach (1996, 1998, 2000, 2005) and 2005 USA Wrestling Bronze Certified Instructor Coach. His accolades include 2005 Miami Herald Male Coach of the Year for all sports, 16-time Miami Herald and 15-time Sun-Sentinel Coach of the Year, and 5-time State Wrestling Class 1A Coach of the Year. Pettineo has been inducted into the Cardinal Gibbons Athletic Hall of Fame, NCAA Division III Wrestling Hall of Fame, USA Wrestling Florida Chapter Hall of Fame and Florida Athletic Coaches Association Hall of Fame. Pettineo is co-founder and sponsor of the Broward County Wrestling Coaches Association. His current coaching record is an impressive 724-42. Pettineo owns a successful independent insurance agency in Fort Lauderdale. He and his wife of 31 years, Lisa, have two children, Gina and Frank. The long time soccer player and coach is one of the state’s winningest soccer coaches. While playing and after graduating from the University of Central Florida where she was an All-American player, Rountree coached six years at Longwood Lyman High School in Central Florida, where she compiled a 69-24-13 record in four seasons as Head Coach. Her success continued at Douglas High School in Parkland when she was hired in 1990 to teach Dance, personal fitness, aerobics, and coach soccer. She guided the girls’ soccer team to four state titles in 2003, 2004, 2005, 2006 and National Championships in 2003 and 2006. During her tenure at Douglas she was named 2006 National High School Coach of the Year, Florida Dairy Farmers Coach of the Year (2003, 2005, 2006), BCAA Coach of the Year (2003, 2005), Florida Athletics Association Coach of the Year (2005, 2006), Sun-Sentinel Girls’ Soccer Coach of the Year (1994, 1996, 2003, 2006), and Miami Herald Coach of the Year (1996, 2002, 2003, 2006). In 2006 her team finished 23-1-1 and won its fourth consecutive Class 6A state title, becoming the first public school to win four straight in Florida. Her career record is 423-66-37 with her teams winning 13 consecutive district titles and making 10 State Final Four appearances. She has recently retired from teaching, but continues to coach. Rountree lives in Tamarac with her husband, Jim Rountree. Her daughter, Shannon, was a top soccer player at Tennessee Tech and recently graduated from Ole Miss with a Master’s degree.